Dr. Sandeep Gupta and special guest Dr. Jill Carnahan discuss the diagnosis and treatment of Mast Cell Activation Syndrome (MCAS), both pharmacological and natural, and how it interacts with Mold Illness/CIRS. 0:08:55 – What are mast cells? 0:11:50 – What is Mast Cell Activation Syndrome (MCAS)? Okay, everyone, welcome to this webinar on Mast Cells and Mold Illness. My name is Dr. Sandeep Gupta, I’m the creator of Mold Illness Made Simple Course. I’m very excited to have Dr. Jill Carnahan here today from Colorado. How are you, Jill? Wonderful this evening. Thanks for having me Dr. Gupta. Great. We’ve got an interesting topic to get through today, and we’ve got a bit of an itch that we’re going to need to scratch. That is the topic of mast cell disorders. I understand you’ve been taking quite a lot of interest in this disorder for a number of years. I have. It’s amazing how many people have this. It’s one of those things like we mention, once your eyes are open to it you can’t not see it. Yeah great, it seems to be like that with a whole bunch of different areas in integrative medicine, in that once you start seeing something you start seeing it more and more. It’s amazing the more different nuances we see in our patients, the more the spectrum of colors start opening up to us. So I’m very exciting to start discussing this one little new hue of the spectrum. Okay well while we’re waiting of the slide show to come up, if everyone might care to take a moment to close any browser windows they might have and grab a glass of filtered water and really just give us their full attention for this next hour or hour and a half or so, because this is going to be some really interesting information that’s not really widely available. Okay so just introducing a little bit about Doctor Jill. Many of you would already know Doctor Jill from her work in the institution of functional medicine and many of the other different conferences she presents at regularly. But really Doctor Jill is a functional medicine expert who treats the root cause of disease and illness. Really this whole area of functional medicine seems to be rapidly getting more attention and wavelength as I guess more and more chronic illness appears to be coming up. I’m not sure what you’re finding Doctor Jill but it seems to me that this new paradigm of functional medicine appears to be much better suited to deal with a lot of these complex chronic illnesses that we’re finding. Yes and even among colleagues I’m sure you see the same. I have a lot of colleagues I went to medical school with and now they’re starting with their family or themselves finding where conventional medicine fails them, like chronic disease, diabetes, obesity, and some of these inflammatory conditions, and a lot of them are seeking more information, and really functional medicine has some of the best answers to some of these complex conditions we’re talking about. Great. So Doctor Jill did her medical degree in Loyola University, and prior to that did a bachelor of science and bio-engineering at the University of Illinois. Did I ever tell you Doctor Jill that I lived at the University of Illinois when I was seven years old, for one year? No I didn’t know that. That’s great. Yes. And you pronounced it right. Illinois. No s.
Exactly yeah. So Doctor Jill is also board certified in family medicine and integrative holistic medicine. She’s also a certified practitioner by the institution of functional medicine, which she’s now a regular lecturer at. She originally founded a Methodist center for integrative medicine and that was in Boulder, is that correct? Actually Perry Illinois, before I moved to Boulder. Then now she’s moved to Boulder Colorado and has founded her own clinic on functional medicine, it’s just outside Boulder isn’t it? Great. And I’m amazed to hear that you have a three year waiting list. And so unfortunately Doctor Jill is not available for new patients at this time, but probably more likely you’ll bump into her at a conference. And interestingly and amazingly Doctor Jill has beaten Breast Cancer, Crohn’s Disease, and CIRS. So the universe has given you a little bit of a crash course in medicine I understand. Actually that is a really important thing I think, and I’ve found Doctor Raj Patel in our last webinar mentioned that he himself had been through Lyme Disease and CIRS, and one of the things about that is it allowed him to understand a lot of the nuances of treatment that he probably wouldn’t have been able to understand otherwise, and I don’t know if you’ve found that to be the same kind of principle having suffered many of these conditions yourself. Yes. Absolutely. As you obviously experience it yourself there’s so many little things that you put together because we know what’s taught and then we know how we felt and what things happened and what got us well and there’s even tricks to getting well that I’ve learned that are not written up anywhere or are necessarily guidelines and I’ve found them successful with a few of my patients as well. So it is a whole different experience when we go through it ourselves. Yes it kind of gives that whole different first person perspective to illness, and rather than just sitting on the other side of the desk and being firmly in a second person perspective where we’re really reading academic science and so on I guess it gives us much more of a 3D perspective on patients and what they’re suffering. So I think that’s really amazing that you’ve been through all those things and you’re now doing so well. And you can find out more about Doctor Jill at her website JillCarnahan.Com. Also she has a really interesting guide to mold illness, which you can download at that website. A little bit about me, most of you already know me who have been following the Mold Illness Made Simple webinars for some time. As you know I graduated here in Australia from the University of Queensland and worked in intensive care medicine for around about five years, where I also had a little bit of a health journey of my own after getting Shigellosis in America and having to repopulate my gut after taking very strong antibiotics, and that was my first introduction into the world of functional medicine, and realizing that we need to take a more holistic approach to achieving health rather than simply strong symptomatic treatments. Since then I’ve gradually transitioned over into integrative medicine doing basically similar things to what Doctor Jill had done during her fellowship in general practice and also nutritional and environmental medicine at the same time. I’ve now got my own holistic medicine practice on the Sunshine Coast in Australia and also in Sydney. I also do Skype Consults worldwide. I’ve been certified in the Shoemaker protocol after I had a little bit of a mold adventure myself. You guys seem to get a lot of flooding over there at times. I understand you’ve just had some major floods in Texas. Well I myself had a house flood up on the Sunshine Coast in 2012 and my partner at the time got very unwell, so I basically did not have any framework to understand what was going on and so that led me to seek out Richie Shoemaker and Skype with him at 1 a.m. in the morning every month or so, and it was a real journey. When I first started talking with him I had no idea what he was talking about. He was just mentioning C4a and TGF-b1 and Pfiesteria, and it was more than a steep learning curve, it was a vertical learning curve. In some way that’s why I had so much passion to create this course, and I was also lucky enough to be a co-author of this physician consensus statement on CIRS with some of the other certified physicians, Doctor Ackerley, Bernstein, Rappaport, McMahn, and Doctor Shoemaker himself. And I have quite a number of websites but one of them is LotusHolisticMedicine.com.au. Okay so we’re jumping into the main topic here. Would you like to start on this one doctor Jill and maybe talk to us a little bit about what exactly are Mast Cells for those of us who don’t know, and what do they do in the body? Sure. So Mast Cells are part of our force of protection, part of our immune system. And these are critical, we couldn’t survive without them, but when Mast Cells go bad then we have these Mast Cell disorders, and historically what’s very interesting is there’s been a disease we were taught in medical school called Mastocytosis and this is actually more of a clonal disorder of the blood cells and the bone marrow where your body produces excess mast cells, and again it’s almost like a precancerous type of condition. So again in medical school Doctor Gupta and I were taught about this but we never saw it very often in clinical practice, and because of that it was a rare kind of Zebra type of disorder, which is what we call things we don’t see very often. But what we’re seeing now is this mast cell disorder where it’s not a clonal or proliferation, so it’s not a multiplication of these cells, it’s an activation of these cells, and that’s a real big difference, because tonight we’re going to talk a lot about the triggers and the things that can activate mast cells. And even though these things are protectors they can go bad and they can cause a ton of symptoms. As you can see in the slide, these are found in every tissue in the body. Everything from the heart to the digestive track, to the brain, to the gut, to the skin, can manifest with problems when you have mast cell disorders. Just like many of these chronic inflammatory conditions like CIRS and mold exposure, it can affect nearly every system in the body. It gets very confusing for physicians who don’t know what they’re looking for because it can manifest with palpitations or diarrhea or brain fog. Those are obviously lots of different systems in the body. So that’s just a little bit about mast cells, and what we’re talking about tonight is not really that mastocytosis, the clonal disorder, but we’re talking about this mast cell activation. What’s the difference? The difference is basically when those mast cells get irritated, it’s almost like they get poked by some environmental trigger. When that happens, and this could be mold which is our main topic tonight. It could also be things like heat or cold. It could be an allergen. It could be an environmental trigger like a toxin, a heavy metal or toxic exposure. Many, many, chemicals and other things can trigger mast cells. Then these patients who have these activated or irritated mast cells, many, many, different things can trigger their activation and cause the symptoms all over the body. Great. Would another way of putting it be that mast cells are actually a good part of our immune system, they’re a normal part of our immune system that under certain circumstances, they become irritated or they become activated because they’re overwhelmed in a sense by what’s happening in the body. Would that be a fair, simple summary? That’s a great way to say it. Yes absolutely. Okay great, so as you said Dr. Jill, there’s a whole range of different mast cell disorders. Really Mast Cell Activation Syndrome is something that was first described in the early 90’s, but it was not first named and actually officially described until around 2007. 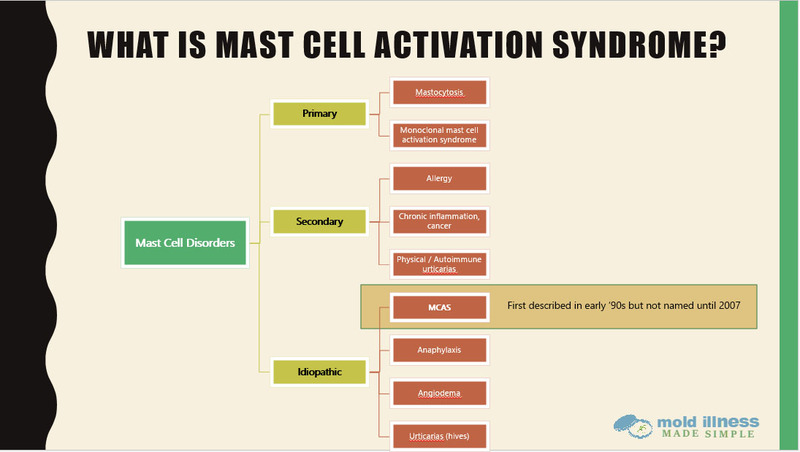 Would you like to talk a little bit more about how Mast Cell Activation Syndrome fits into this spectrum of Mast Cell Disorders? Yeah just like I mentioned before, what you can see at the top of the slide is that the primary Mastocytosis is the thing that we are typically, these are like clonal disorders. There’s activation where there’s proliferation and where the body just creates, just like if you had a bone marrow leukemia where your white blood cells proliferate and you make too many white blood cells. In this case, in those clonal disorders, your body makes too many mast cells. That’s a whole different problem because that’s rare. It’s not usually triggered by a chemical irritant. What we’re talking about tonight is more this irritation or I just think of it as you poke a bear and you poke the mast cells with a chemical, a trigger, a mold or toxic chemical. 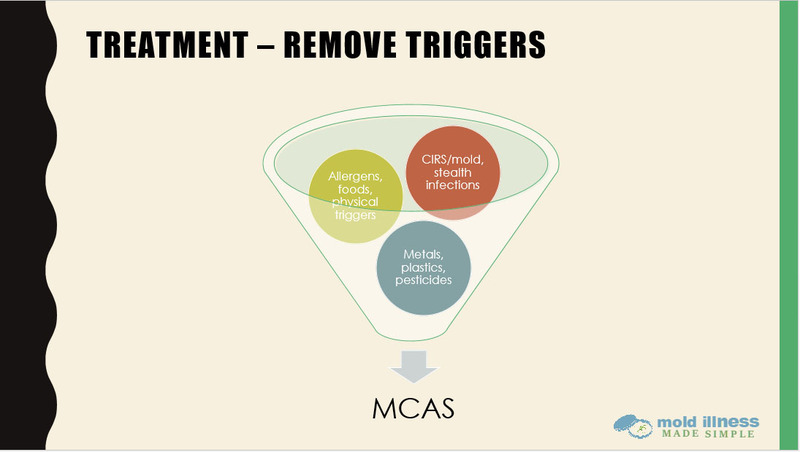 We were just talking before the webinar started that we think most likely, according to the research, mold and according to talking to the experts, mold is probably the number 1 trigger to mast cell disorders like the MCAS we’re talking about. The difference is this is not a proliferation of those cells. This is an irritation and an activation of those cells. You may have the same number of cells but they become irritated. 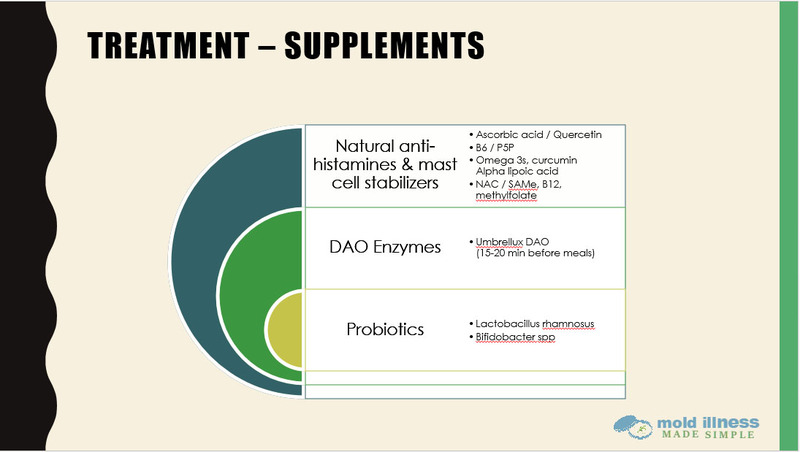 They pour out all all the things listed in that previous slide, prostaglandins and histamines and cytokines , complement split products. Typically we think about mast cells and histamine because histamine is a huge player. The honest truth is that hundreds of chemicals have been measured for mast cells. It has a wide range of activities. There’s more than just histamines that’s involved. Great. Thank you for that explanation. Okay let’s talk a little bit about the symptoms of Mast Cell Activation Syndrome. It’s interesting to notice that just like CIRS, which is the main syndrome related to mold, that’s known in the community at the moment. MCAS appears to affect almost every organ of the body. It’s very widespread. 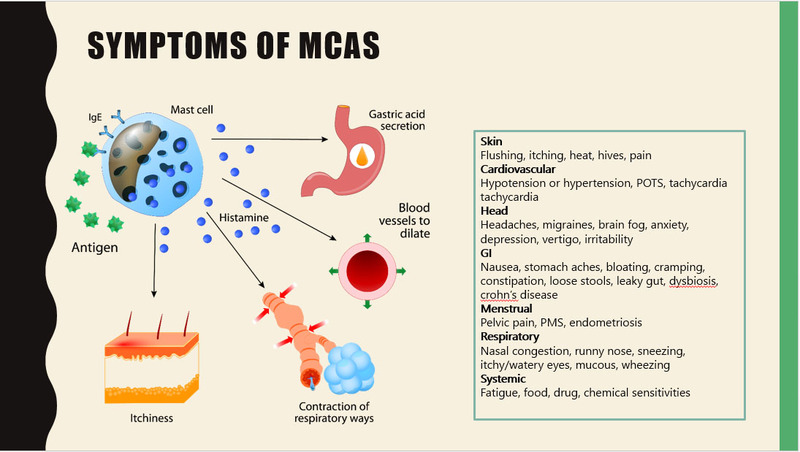 I’d love if you could share a little bit more about what some of the symptoms of MCAS are. Sure. I teach frequently with Dr. Dale Bredesen on reversing Alzheimer’s disease. That’s relevant because the number 1 symptom we see with Mast Cell Activation is actually neurocognition; memory, focus, attention, brain fog, which are obviously common in Sears as well. I want to emphasize that because we think about the skin and the heart and some of these things I’ll talk about in a moment. The number 1 symptom is actually brain symptoms; brain fog, focus, concentration and memory. That’s very common with CIRS as well. As you will recognize when we describe these symptoms, a lot of it overlaps with CIRS. What Dr. Gupta and I were talking about earlier is CIRS is treatable in a methodical approach and according to the Mold Illness Made Simple program is a great way to address this. When people don’t get well, sometimes this MCAS, the mast cells have been activated. That’s part of the problem that lingers on. Things like flushing and rashes, all the classical histamine types of stuff on the skin. The skin may be the organ that has the most mast cells so we often see, Dr. Gupta, I don’t know if you’ve seen but I know in a lot of my CIRS patients, they will have hives and flushing and lots of skin reactions especially if they get in contact with mold or if they’re detoxing from mold. They will often have skin reactions. Cardiovascular is perhaps the most dangerous because these people can drop blood pressure. They can become very, very hypotensive. They can become hypertensive. Something we see very frequently with CIRS as well as the POTS, the Posterial Orthostatic Hypotensive Syndromes, where they can’t regulate their autonomic volume and they’ll get dizzy or light-headed when they stand up quickly. The heart racing, of course, is another common one. We mentioned the brain fog, but also headaches and migraines can be common. Mood disorders are extremely common, forms of anxiety and depression, irritability or anything along those lines. The GI system is profoundly affected as well. I’m going from memory, but I would guess second to the skin, the GI tract probably has the second most mast cells. Very frequently people have diarrhea, acute diarrhea, abdominal pain, constipation, nausea and discomfort, like even gastritis types of symptoms. This can affect hormones. Women may have menstrual cramps or irritability or PMS types of symptoms. Respiratory very frequently affected. Histamine, of course, is a player in allergies and asthma. We see sinus congestion as mucus membranes with histamine fill up with congestion and fluid. We can see edema which can cause respiratory distress, shortness of breath, wheezing. Then systemic fatigue is extremely common. 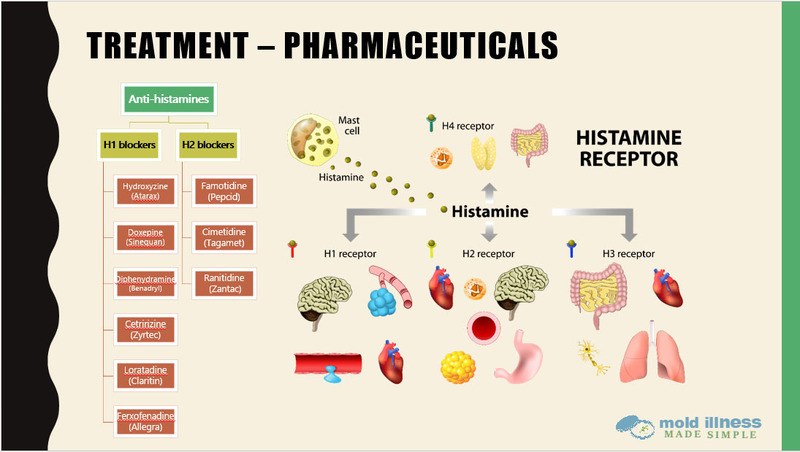 Then because histamine is something that causes both brain, blood brain barrier permeability, mast cell permeability and gut permeability, we frequently see more food allergies, sensitivities and symptoms that go along with this kind of leaky membrane concept. Wow. So really it’s a very widespread syndrome. It’s interesting to note that some of the symptoms are more specific like the classic skin rashes, sneezing and itching. In some cases like with the fatigue and the abdominal pain, it may actually be quite difficult to differentiate whether symptoms are just due to generalized inflammation or due to mast cell activation, I imagine. Do you find that there’s any particularly helpful ways for someone who’s got a multi-symptom, multi-system disorder to differentiate how much of their symptoms may be due to a simple CIRS type process versus chronic infections versus MCAS? What a great question because I know you and I grapple with this every single day with our patients and what piece is playing the biggest part in their illness. What’s interesting is we know that triggers for Mast Cell Activation Syndrome are both infections and toxins. I know in my clinical functional medicine practice, infections and toxins are the two biggest players by far. That would include mold, of course. These are triggers. Since we see so many patients with hidden and occult and heavy burdens of infections and toxic load, a lot of them have mast cell stuff as well. Differentiation is really trial and error. You’re gonna find with this whole presentation there’s no one magic test. There’s no one magic treatment. I wish there were. It is a lot of trial and error. We’ll talk about some of the solutions and treatments. What I’ll usually do is do some trial with antihistamine in treatments and see if the patient resolves symptoms. Great. Okay that makes a lot of sense. In some cases, it just sounds like by going down, for instance, if a CIRS patient has gone down the traditional protocol with using cholestyramine, and eliminating their MARCoNS and doing some of the various intermediate steps, also VIP nasal spray. Perhaps if they start noticing there’s an increase in some of these specific symptoms, particular around skin rashes and itching and that sort of thing. Is that a situation where you may think that a CIRS patient should start considering about MCAS as a possible contributory factor? Yeah, if you don’t mind, Dr. Gupta, I will bring in a little personal experience because I think this is very relevant. This is one reason why I am so interested in this as well. You mentioned in the beginning of 2014, my office flooded and I had a massive mold issue. I didn’t know about it for several months. When I found out, of course, I moved and did the Shoemaker Protocol to get well. Today, I’m 99% better. I still have to be careful to avoid massively moldy environments. The important point is when I got out of the situation and I started to detox, I got out of the exposure to the mold, I left the office and then I started binders. What I noticed for about two months, I had almost total body hives and it was very severe. Obviously, I knew how to deal with it and I took antihistamines and it controlled it. In hindsight, I had massive mass cell activation in the detox. As the mold was trying to eliminate from my body through the treatment and getting out of the exposure, I actually had this syndrome in a very severe way. I had the brain fog, I had respiratory and GI distress but on my skin, literally from my neck down, I was covered in hives. I have experienced this firsthand and I know how that can be and how scary it can be. That was part of the CIRS process and part of the treatment. I no longer have that severity of reaction but people who are prone to mast cell activation are going to be prone to it from any sort of trigger. For example, I am going to be more prone to hives in reaction to some environmental chemical or some airborne exposure like VOCs even now to this day and so are our patients. They’re going to be more prone to that when they get exposures. Okay, great. That’s a really, really practical example. For instance, when that happened to you when you were taking binders and you started getting hives, did you have to go on a sidetrack for some time and treat more of the mast cell side of things before you could go back on to the Shoemaker protocol? Great question. Because I’m bound and determined to get well, as you know, from all my illnesses. I was just pushing through and I was like, “What the heck? I don’t care. I’m just going to push through,” but what I did too, I took high doses of quercetin, vitamin C and I took high doses of Benadryl at night and it really controlled it enough so that I could work and live and survive during that two months. Okay, great. Well, thank you for that example because I’m sure it’s always practical examples that illustrate. 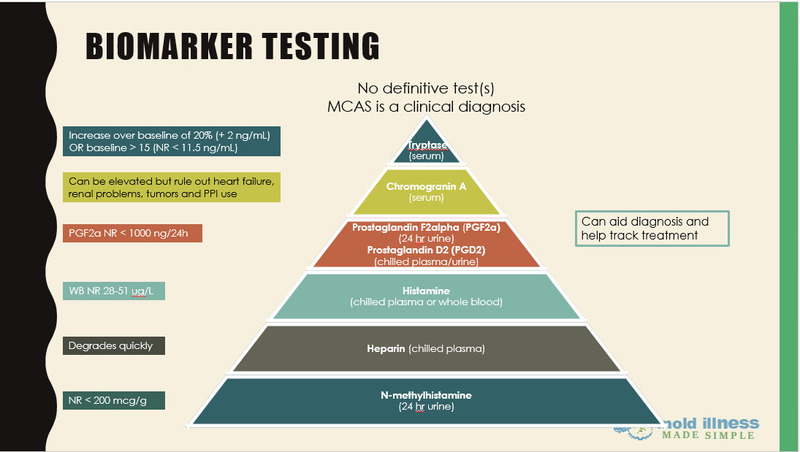 Jumping a little bit more into testing for MCAS, and as you’ve already said, really, there are a number of different diagnostic tests that exist but none of them are perfect and that perhaps contributes to the diagnostic difficulty with this disorder. I’m wondering if you’d like to talk a little bit more around some of the biomarker testing and what you’ve found about it and the reliability and so on. It is so difficult. Gosh, I have so many people say, “Well can you test me for mast cell activation?” By all means, I’m happy to test but first of all, when I’ve looked at our conventional labs, LabCorp and Quest in the US, no one lab can do all these tests for me. Just like CIRS diagnosis, it can be kind of tricky to get the labs. Then, secondly, they have to be handled, as you’ve written in these beautiful slides, like histamine and heparin, extremely carefully, put on ice immediately. If your lab tech or your lab doesn’t know how to handle it, it will be inaccurate. There’s lots of nuances with just ordering the tests and getting the sample, let alone the actual results. Then, when you get the results, what often happens, the serum tryptase is probably your easiest. Often, as I’m doing the CIRS labs, I’ll throw in a serum tryptase because that’s easy to do. You can also do a whole blood histamine. Those two are my most common first lines because they’re easy to order through most labs and they’re fairly accurate. Now, the problem is a lot of people, we talked about clonal disorders, clonal disorders, they’ll often have abnormalities here but many of our mast cell activation patients will have normal labs. As long as you keep that in mind and know there’s only a small percentage of patients that actually come up with abnormal labs, then you can still test but you may not always find what you’re looking for, even in a patient who has this syndrome. Right. Okay, great. In Australia, for instance, we’re able to get the tryptase and the chromogranin A and histamine and the N-methylhistamine, however, the prostaglandin F2alpha and prostaglandin D2 don’t appear to be commercially available at this point. Generally, the heparin test that’s available is not a chilled plasma sample. My experience so far is a lot of patients who clinically appear to have it, these lab tests may not be outside the normal reference ranges and so they can be tricky. Interestingly, the whole blood histamine rather is something I already do as part of my basic workup for methylation. As you know, the Walsh/Pfeiffer approach, he uses whole blood histamine as a marker, a surrogate marker, of total methylation. People, so we have a whole bunch of people in Australia who have a high histamine who we refer to as under methylated. That, I guess, that speaks to, I don’t know if you’d like to speak very briefly about the connection between methylation and mast cells but it appears to be an important connection. I’m so glad you brought that up because that’s the key and so many are interested in their MTHFR status and so I would love to talk about that. One thing I wanted to mention just to be clear, this is a clinical diagnosis, as is many things. The tests are ancillary and they’re important and if your doctor can order them, wonderful, if they’re positive, wonderful, but as Dr. Gupta and I know, this is really one of those clinical diagnosis with someone with symptoms who responds to treatment. Dr. Theoharides, one of the main experts in mast cell activation disorders, agrees that really blood tests can’t confirm or deny the presence of this illness. Back to methylation. Methylation one of the main markers as many other genes that play into it but MTHFR, a lot of people know their status or have heard or read about MTHFR, A1298C and C677T. When people have mutations in those methylation genetics, they have impaired methylation. If they don’t have enough active methylfolate or active methyl B12 or P-5-P or riboflavin, they’re prone to have problems with methylation. Methylation is one of the pathways our bodies uses to break down histamine. Because of that, if you have impaired methylation or deficiencies of those B vitamins, with the genetic mutation, you’re going to be really prone to problems with excess histamine. It’s basically because your body can’t break it down. There’s other genes as well like DAO and MAO enzymes but the MTHFR, it tends to be a big one in the breakdown of histamine. Great. If people are showing the signs of undermethylation and they’re certain symptoms they could look up online, particularly on Dr. Walsh’s website, and if they’re running a high histamine, is there any particular methylation support that you generally recommend to these patients? I do. Yeah. Pretty much, I will check all my patients for MTHFR status because I do feel, even though there’s many other genes, that tends to be a big player and it’s something we can clinically intervene and help them with. Methyl B-12 in some patients, they do really well with just methyl B-12, some methylfolate. Order of adding those in can be very important. I find that B-12 is the first one to add in and then the methylfolate, secondary. Then co-factors such as SAMe, magnesium, zinc, riboflavin, P-5-P are all critical so sometimes, I use a formula with all of the B vitamins in it and maybe some magnesium and zinc. The endpoints of MTHFR and methylation pathways is actually the production of glutathione. Glutathione helps us deal with toxic exposure and liver detox and so sometimes, giving them liposomal forms of glutathione if they have impaired production of glutathione will also be helpful in the methylation issues. Okay, so the other really important side to this is there can be an overlap, as you know Dr. Jill, with MCAS and other conditions and often, patients with MCAS may have various other allergies and asthma. It can coexist with autism, autoimmune disorders, et cetera, and most importantly, as far as this cause is concerned, a 30 to 50% overlap with chronic inflammatory response syndrome. Would you like to talk a little bit about the overlap with other conditions and how, what sort of challenges does that present in clinical practice? Yeah. What I find is, for example, the list there including CIRS. Those tend to be the primary diagnosis that we look for and in my assessment, I’ll write a list of, say, Hashimoto’s plus CIRS plus IBS. What we see is that histamine and prostaglandins and the effectors from the mast cells have a big role in a lot of these diseases and the reason for that is obviously, if we think about histamine with allergies and asthma and respiratory distress, that’s clear. Things like autoimmune disorders and gut issues, GERD, IBS, are all related to a permeable gut lining. We know from Dr. Pisano’s research that the three things common to all autoimmune diseases are environmental trigger, genetics and a leaky gut or hyperpermeability and because histamine and these prostaglandins all have an effect on permeability of both the blood-brain barrier and the gut, a lot of times there’s overlap because who knows which came first, the chicken or the egg, but those things that the mast cell secretes can cause a lot of these symptoms. They definitely overlap. What I find, the mast cell diagnosis and treatment comes when I’m hitting a wall or when I’m finding patients that I’ve tried to treat and they’re not getting better, then I start to look for the MCAS diagnosis. Great, yeah. It almost like it seems to me these days, Dr. Jill that it’s more the rule rather than an exception for patients to have multiple diagnoses rather and multiple syndromes going on rather than just one. It seems that the old medical rule that generally, patients just have one diagnosis seems to not apply anymore. Just the complexity of patients and their presentation seems to be increasing. I don’t know if you’re noticing that. So jumping on a little bit to Chronic Inflammatory Response Syndrome (CIRS), and I know most people listening to this webinar will be already familiar with this syndrome, but just talking a little bit around the theory of how this is developed and how this can link in with Mast Cell Activation Syndrome. 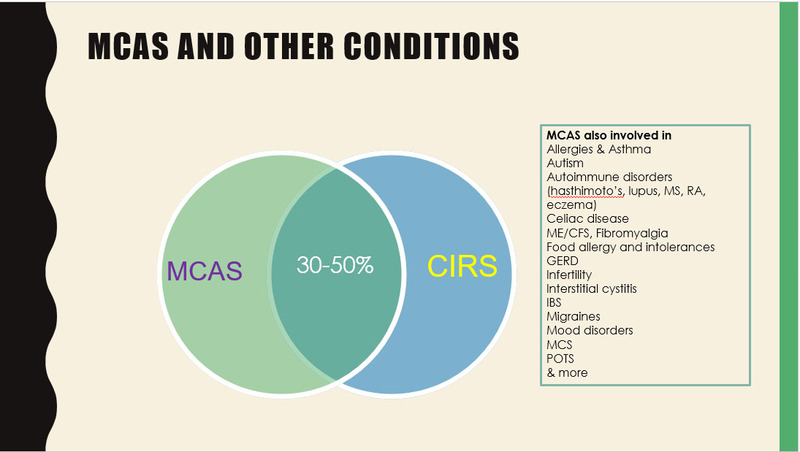 As we’ve already said, there’s around about a 30% to 50% crossover between CIRS and MCAS. Maybe understanding the mechanism of how CIRS develops can help us understand how this crossover is so common. Talking a little bit around toxins to start with. As we know, firstly, the problem is not just mold and mold spores. It’s a whole microbial soup that we can pick up from a water-damaged building or from a tick bite. It’s important to know that if you get a tick bite, it’s not just Lyme disease that you need to be worried about. That’s another microbial soup where there can be up to 15 different organisms that people can pick up from tick bites. Biotoxins and inflammagens that are either inhaled from a water-damaged building, or taken in through the blood via a tick bite or other vector bite, can cause, in certain people who are genetically predisposed, to have this chaotic and inefficient inflammatory response. Basically, if you’ve got a gene type, like the most classically-described one is called 4-3-53, and if you have this gene type and that’s been activated by an infection of some sort, whether it be a viral infection such as Coxsackievirus virus, or Epstein-Barr virus, or even a tick bite, then that can lead a person to not be able to have a proper antigen presentation. In other words, they can’t create a proper antibody response. Then as a result of that, they have this chaotic and inefficient inflammatory response. We talk about this in our course quite a lot. This chaotic inflammatory response leads a patient to develop a multisystem, multi-symptom illness that can even persist for years after they’ve been removed from the source of that illness. In some way, what happens you could say, is that the host response becomes the illness. I think there’s a clear crossover here with MCAS as well. I think this whole mechanism of development of CIRS that’s been described by Dr. Shoemaker and his research team also fits in quite well with MCAS, you could say in a certain sense. Because, again, what’s happening is that the immune system is becoming hyper-activated and is overactive, you could say. Would you like to talk a little bit around that, Dr. Jill, and your thoughts around the connection? Brilliant. It’s so true that these toxins that are also triggers to CIRS can also be triggers to the mast cells. They very, very closely align. That’s why we see your estimate 30% to 50% of people can have both syndromes. One thing I think is important to understand, that I often teach even to other physicians, is total toxic load. This concept, I always describe it as we have a bucket ability we’re born with. That ability is a conglomeration of our genetics and our ability to get rid of toxins. Those of us with CIRS, or who have had CIRS, or have the dreaded or high-risk genotypes, we have a more difficult time tagging and identifying these toxins, and getting rid of them. This can cross over. CIRS is one aspect of these inflammagens and the toxic soup that you so well described in a water-damaged building or from an infection from a tick-borne illness. But what we see is our total toxic burden right now in our environment. This is one of the reasons why these diagnoses are so complex and usually multiple in our sick patients is because total toxic burden nowadays is huge for the average person. What determines whether or not they get ill or stay well is their genetics and their ability to get rid of these toxins out of their body. Once that bucket is full, it starts to overflow on the top with symptoms and illness. Part of our healing the patient is taking that load, that total load down, getting them out of a mold exposure, getting rid of some of the infections. Because if they have margin in the top of their bucket, they’re able to detox and they’re not so triggered in this mast cell activation as well. Right. In the same way one develops CIRS, one develops a hyperactive mast cell arm to their immune system. Presumably even, for instance, if the initial trigger was mold, for many patients, even when they get into a much more satisfactory building that’s not water-damaged, they may still continue to have mast cell activation. Is that correct? That’s absolutely correct. It’s almost like once these cells get irritated, it can last for a long time. I told you my personal story. That was 2015. It’s two years later. I’m doing 100% better and no hives, but I definitely could be triggered by allergens or things that could trigger the mast cells. It’s still there. It’s like a hungry lion waiting for an antigen to trigger it. In the right circumstance or exposure, I could still have, and so could my patients, some activation symptoms. Right. You don’t feed the hungry lion, is that right? Okay, so as you know, there’s a whole alphabet soup that we learn when we’re going through this CIRS physician training with Dr. Shoemaker. As my poor brain at 1:00 a.m. at night was trying to understand what MSH, and VIP, and MMP-9, TGFβ-1 were, it’s now part of my everyday alphabet. 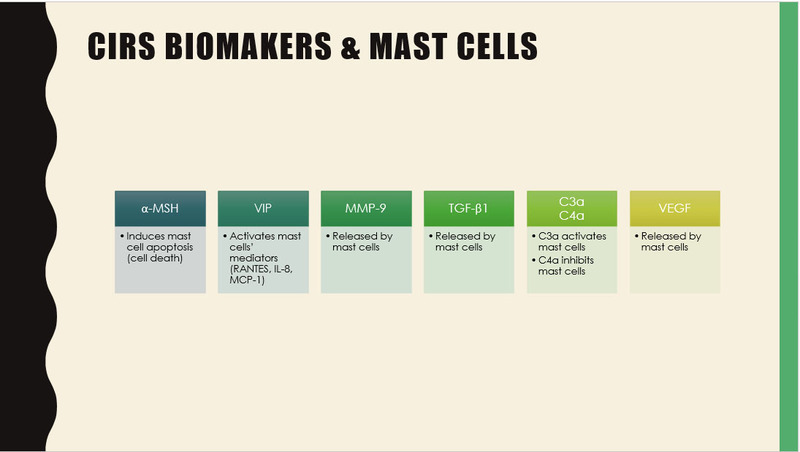 It’s interesting to also note that there is an interaction with many of these CIRS biomarkers and mast cells. Would you like to talk a little bit around those CIRS biomarkers, and how they interact with mast cells, and how they may give us a clue as to what might be going on with our mast cells? You bet. Beautiful job on these slides. This is just so nice and so concise. What’s interesting is I love the interplay because it all starts to make sense when you understand these markers that we look at with CIRS, and how they affect the mast cells, and why there’s such an overlap in these two conditions. MSH is something we see low all the time in CIRS. 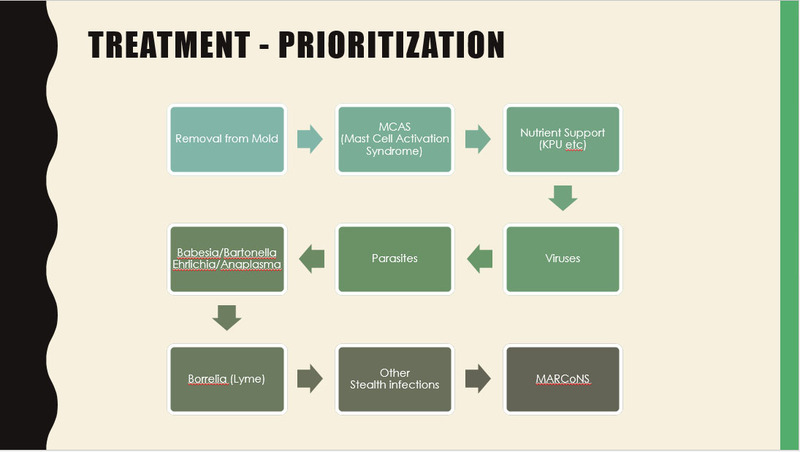 Obviously, we know MARCoNS can inhibit MSH. The interesting thing is we talked about histamine and prostaglandins in increasing permeability of the blood-brain barrier and of the gut, and all that that entails, and all the diseases that it causes. Well, MSH is one of those things that if it’s low, you almost always have a situation with massive permeability. Getting that MSH up is another way to help with intestinal and blood-brain barrier permeability issues. If it’s normal, it actually induces mast cell death. Some of that excess activation would be toned down a bit when the MSH is normal, which it usually is not in CIRS. VIP, this is very interesting. I don’t know if you know this, Dr. Gupta, but there’s a small percentage of people that actually have increased in histamine with VIP use. There’s a documented study. What’s interesting with this is in these people with mast cell disorders, some of them have to be a little bit careful with VIP because it can trigger some respiratory issues or shortness of breath, almost like a wheezing type of thing. It’s rare, but it’s not a panacea to everyone if you have mast cell issues. Just a caution and obviously you would talk to your physician about the appropriateness of use. There usually is a time and a place where it can be used. MMP-9 is also released by mast cells. We see this elevated in CIRS. Whether it’s the mold and water-damaged building, toxic soup inducing mast cells, which are inducing elevation of MMP-9, which we measure, or some other form, we see this altogether in CIRS as well. TGFβ, same thing, also released by mast cells. Then interesting, C4a we more typically see with mold. C3a we more typically see with a bacterial trigger. But C3a can actually activate mast cells, while C4a can inhibit. That’s very interesting to me because we can see mast cell activation in both elevations of C4a and C3a, even though one of them activates and one of them inhibits. Then, once again, just like the MMP-9 and TGFβ, the VEGF is released by mast cells as well. We see this elevated in CIRS as well. Okay, great. It sounds like that these biomarkers are extremely useful tests and often do point towards a diagnosis of CIRS, but in some cases, they can also be elevated by other conditions. MCAS sounds like it is one of them. Dr. Raj Patel, on the last webinar, also said something very surprising, which is that in some patients he had found that addressing mast cell activation and putting them on a low-histamine diet in fact had lowered their CIRS biomarkers such as MMP-9 and TGFβ-1. Have you seen that happen at all in practice? Absolutely. There’s been a few cases where I really believed it was CIRS and we kept looking and either didn’t find the trigger, or they had been out of the exposure, and treating the MCAS brought everything normal. To me, that was pretty eye opening. Great. I think we’re seeing more and more as we go along that there’s a little bit of a non-specificity to these tests. We always need to keep our eyes open of what the possibilities could be. I guess this goes back to your total toxic load idea. If you have any further comments on this idea of removing triggers to remove, to reduce the total toxic load. This is a beautiful example because this funnel could represent your bucket very, very similarly as my analogy was. Basically, as your bucket gets more full and CIRS, this is a massive load. That could be a large percentage of the load in the bucket, but other allergens and toxic metals and chemicals and plastics and pesticides. Just getting someone in a clean environment, and clean food. When I’m lecturing I always say clean air, clean water, clean food. That is the basis of health. Sometimes we forget and we want to use lots of medications and supplements, but clean air, clean water, clean food is such a core. That’s where it starts. Making sure you’re not loading your body with toxins just with your makeup or your bath and body products or your cleaning products. That’s pretty simple. And clean food, so making sure you’re eating organic, local if possible, grass fed, all the kinds of things that have a less toxic load for your body. What we find is sometimes this can feel overwhelming, because we’re getting exposures from all kinds of chemicals and things in our food supply, in our air supply, but all we need to do is remove part of the load. All we need is a little bit of margin to start to heal. We don’t need to remove everything. In the case of mold, you really need to avoid the mold, but in all these other toxic chemicals it’s not that you have find 100% of the toxins and clear 100% out. Our bodies want to heal. As long as you take some margin and you take away some of the major toxins and decrease the load, the patient will get well. That’s kind of exciting, because otherwise it feels overwhelming to deal with all of these things. Absolutely. I like that. I often tell my patients that it’s really what you do 99% of the time that matters, and if you very occasionally slip up and have a big ice cream, well, enjoy it and get back on the program. There does appear to be some supplements which can be of benefit in MCAS. There’s a whole, long list of them, but I’m wondering if you could talk around the supplements side of this and which you’ve found to be most helpful. Sure. I love this, because I find the natural mast cell stabilizers can be very, very effective. My favorite is quercetin, hands down. Almost anyone with mast cell disorders or allergies, I start on quercetin. That along with vitamin C, which can be often in a powder together or separate, can be extremely helpful. Vitamin C, or ascorbic acid, is a natural mast cell stabilizer and antihistamine. Almost everyone can use it, and it’s quite safe for nearly everyone, including children. Both quercetin and ascorbic acid, there’s almost no contraindications to those two. Those are two I use in nearly every patient who has mast cell issues. Just a quick question on that, Dr. Jill. Do you ever use intravenous in these cases, or would it almost always be oral? Great question. IV vitamin C would be very, very helpful in these patients, but, whether it be IV, Myers’ cocktail, or glutathione, or vitamin C, what I find is there’s spikes and then they’ll go back down. So I’d almost rather do a daily dosing of a liposomal form or some form where they’re getting absorption daily, than an infrequent IV. Then B6 and P-5-P play into multiple things. They are co-factors in the breakdown of histamine, including methylation, so they can be extremely helpful for that reason. Some people don’t do well with B6, but P-5-P, or pyridoxal 5 phosphate, as the active form, and that can be tolerated in almost all of our patients. It’s a little bit more easily bioavailable to the body. Omega 3’s are huge, and we use this is in CIRS too to kind of calm the inflammation and decrease their reactivity. This is powerful anti-inflammatory, anti-prostaglandin, and that’s why. Because mast cells produce some of the inflammatory prostaglandins, and the Omega 3 pathway actually inhibits that. So that can be real powerful, and I frequently use fairly high doses in inflammation and autoimmune disease. Anything from four to six grams at times of the fish oil. Curcumin is interesting. Curcumin can be very helpful anti-inflammatory, but in certain people it can actually induce histamine. So I do want to say a caution with curcumin. There’s a small percentage of people that actually don’t do well with curcumin, but it is an anti-inflammatory. It’s often anti-pain. It’s anti-cancer. It’s got some wonderful benefits, but not everyone with mast cell disorders benefits from curcumin. N-acetyl cysteine (NAC), for multiple reasons is effective. It’s a precursor of glutathione. It’s a good respiratory support for the lungs and sinuses. Again, a lot of patients do very well on NAC. A lot of these you can do multiple things at the same time, or you can find what works best. This list of natural anti-histamines, many of my patients are on all of them. SAMe is a universal methyl donor, so that whole methylation pathway – it can be very helpful in adding in when the patients can’t create methylation products. Then we mentioned B12 and methyl folate, and those are also enhancing methylation as well. DAO enzymes. Let’s talk a little bit about that. That can be profoundly helpful for food induced histamine reactions. Some of these patients, their load of histamine is so high because their mast cells are activated, that a little bit of histamine from food can be a huge trigger. I think you have a slide in a few moments we’ll talk about specific foods. Something that could be powerful is mealtime inhibition or breakdown of histamine. That can be done through European Formula. I think they’re the only ones that make it now, and that’s called Umbrellux DAO. You can take one or two caps with your meals. Again, some people react to all kinds of foods, so they take it with every meal. Some people just take it with the high histamine foods. It really helps that mealtime reactivity and symptoms. One other thing that’s not on your slide that could be helpful for mealtime reactivity is cromolyn. Another name for that is, I’m blanking on the name, but cromolyn, is the generic name for that. That can be taken in ampules with meals to decrease the histamine activation as well and the reactivity. Gastrocrom is the brand name of that. Then probiotics. I’m so glad you put this up here because certain probiotics actually decrease histamine and other probiotics can actually increase histamine. So if you’re a person with MCAS, you actually need to be very careful about not only your gut microbiome and what composes it because your own gut bugs, enterococcus, streptococcus, and yeast can actually produce histamine. Certain probiotics like Lactobacillus casei can increase histamine as well. We know Bifidobacter species actually decrease histamine, and Lactobacillus rhamnosus may decrease or is at least neutral with histamine production. Great. It’s good to see that there’s so many supplements that can be of benefit in this disorder. Another really important part of the treatment, just as many of the different disorders we treat in functional medicine, is diet. I was wondering if you could talk a little bit around the low-histamine diet and really how people can get their head around this. 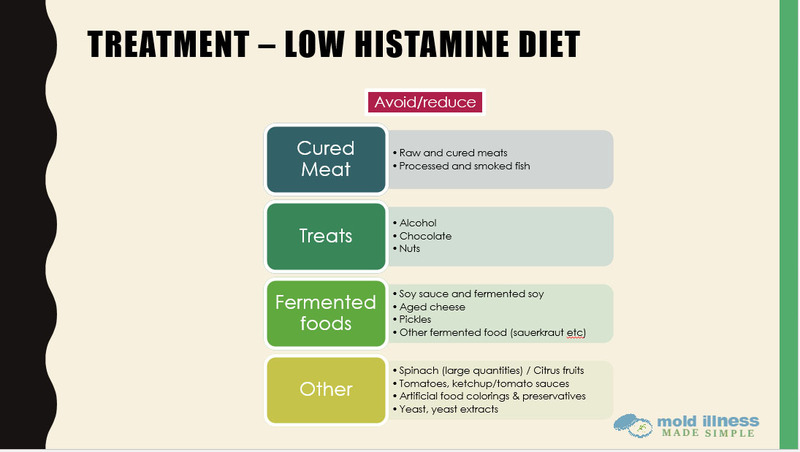 Also keeping in mind there seems to be a number of different low-histamine diets around, and how people can find one that seems to be reliable. Some of my patients have gotten to know the low-histamine chef. She’s got a great work, and she talks a lot about this. She’s a chef, so she knows about meal prep. That’s a great resource for patients who want to know more. If you think about things that are either fermented or aged or have sat around a long time like leftovers, those are commonly producers of histamine. The more something starts to decay, it’s going to produce histamine. Just understanding that will help you kind of remember what might be histamine containing. Smoked meats, aged meats, things like aged cheeses or wines, alcohol, chocolate, and nuts can be an issue. There’s lots of different things that are listed here that can be pickled foods, and those are typically problematic with patients with histamine issues. Even though these don’t, by themselves, create mast cell disorders, they’re part of that load, part of that funnel or the bucket. If you try to decrease your exposure to foods you may lower your histamine load enough, so that it’s not a big problem for you. Do you recommend generally that patients try this diet before trying some of the supplements, or is there no one right answer for everyone? Some people really have this mealtime problem, so they have stomach pain or diarrhea or they really notice mucous or congestion or sneezing or headache or migraine. When their symptoms are really correlated with mealtime, then I go towards the Umberllux DAO’s, the cromolyn or Gastrocrom, and the foods. There’s a lot of people that it doesn’t matter, mealtime or not, there’s not really an association with foods, and then they don’t need to worry quite so much. I would say most people with mast cell disorders alcohol, chocolate, aged foods, fermented foods may be a trigger for things like a migraine headache. Often when they’re really activated and very, very sick, just decreasing histamine in their diet will help them a lot. I would say most people we start, like, quercetin and a lower-histamine diet at the same time. Great. Also, just to mention in a lot of gut healing programs, we’re talking a lot these days about bone broths and fermented foods, however, I guess it’s worth noting that they’re a bit of a caution food for people with mast cell issues. Could you talk around that a little bit? 100% agree. I love bone broth. It’s amazing for gut healing, but what happens is just because it’s a cooked and the meat is higher in histamine, it can be a huge trigger for our patients with mast cell issues. The bone broth proteins and the bone broths themselves are probably a no-no if you have mast cell disorders. Then that takes us to pharmaceuticals. Of course, with these kind of disorders we really have all the different tools available to us, so we don’t shun even pharmaceuticals if they’re needed, particularly in patients who are not getting better with the basic things, such as diet and supplements. Just wondering if you’d like to share how and when in the process of treatment you might tend to bring in a pharmaceutical agent and in which way you’ve found them helpful? You bet. Like I said before, almost everybody gets quercetin and vitamin C. Those are simple and easy and safe. Then we start to add these things when patients aren’t responded. A lot of people do very well on medication. The first H1 blocker is kind of a given, just because we know, I mentioned in my situation, Benadryl was a profoundly helpful, Benadryl tends to be very, very helpful but the drowsiness can be a probably for some people. If they do find that helpful, they just take that at bedtime. Zyrtec, Zantac, these newer generation antihistamines can be just as effective and they can take them daily with minimal side effects. Then the H2 blockers, often Zyrtec, Zantac, the two “Z’s” are taken together because you have an H1 and an H2, but you can really combine any two of these together so that the patient gets an H2 blocker and an H1 blocker. Really trial and error is where it’s at. 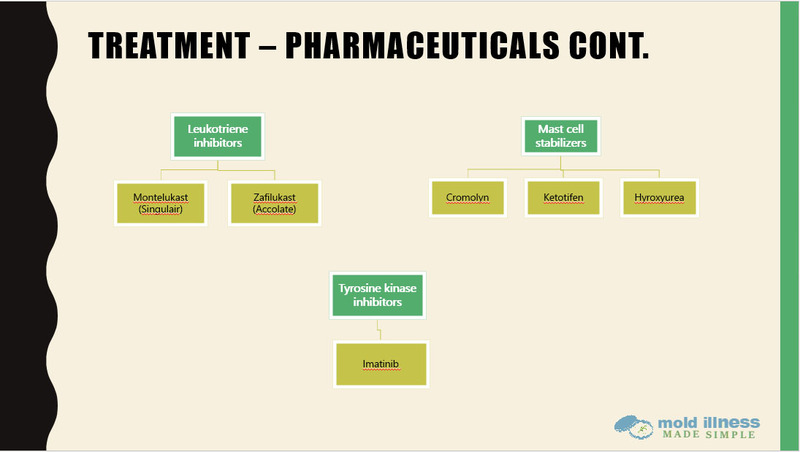 Because mast cell activation is chemical triggered, a lot of the excipients in these commercially produced medications are triggers, so there’s very frequently times when we have to compound one of these medications for a patient. I have a very sick MCAS patient where we’ve compounded so many different things and it’s gotten quite expensive, so we found what was working. It can be a trial and error thing that can really be difficult, but it’s worth trying every single one of these if you have an issue, because sometimes one of them will work and the others won’t. Two that aren’t mentioned here that I think are important would be something like a compounded ketotifen. That’s kind of a generalized mast cell stabilizer. Oh, thank you. There they are. I found, Cromolyn, I mentioned with meal time, and the ketotifen to be extremely, extremely helpful for many of these patients. Ketotifen is not commercially available, but at least in the US it can be compounded quite easily and it’s not very expensive. The other things that are listed there are the leukotriene inhibitors, and those can be very helpful like a daily Singular. I usually add these things on to the H1 and the H2 blockers. One interesting thing that’s not listed here and not commonly known is benzodiazepines actually have an antihistamine effect as well. While I don’t like to get patients dependent on those medications, for some people who are very sick, the benzodiazepines can be very helpful. Great. It sounds like there’s a number of different pharmaceutical options. If we could just backtrack one slide, thanks, just a quick question around the H2 blockers and particularly like Zantac and Tagamet. As we know in integrative medicine, quite a lot of patients do tend to have low stomach acid. Do you ever find that the use of an H2 blocker, which actually to some degree block stomach acid production, can be an issue in terms of people’s digestion or the stomach acid production? What a beautiful point, because we just talked about B12 being critical to methylation, and obviously this would inhibit absorption of B12 if there’s low stomach acid. What I find is typically in the severe activation period, which could be several months, six months, up to a couple years, sometimes these things are critical and life-saving, and so short-term use. You mentioned such a beautiful point, because the shortest use possible of any of these things is the best. I do find people get out of this as long as they’re avoiding exposure and decreasing toxic load, they don’t need these things forever. Okay, great. Yeah. That’s a simple solution. I guess if they’re on proton pump inhibitors as well that might also be another small point, that mixing those with something like Zantac in someone could be a bit of a double whammy to the stomach acid. All right, so we’re getting up towards the end here, so really just to put this in context for people who are dealing with complicated chronic illness, and particularly that involves mold exposure and who may be wondering about, “Well where in the process might I start thinking about mast cell activation syndrome?”, this is actually a diagram that came from Dr. Raj Patel in the last webinar. I’m wondering if you could talk a little bit about this, and this as a possible flow chart for the different steps they may care to look at. I love this, because I would agree. Obviously removal from the source is key because you can’t even come close to getting those mast cells under control unless you get the main trigger, which often is a water damaged building and then inflamagens associated with it, out of the picture. That is by far number one. You’ll never be able to overcome that with quercetin or Vitamin C. getting them out of exposure. Then I do think dealing with MCAS is huge because it affects, just like CIRS, there’s so much overlap with the brain and the brain fog and the gut issues, and the heart issues, and the POTS and the orthostatic issues, and all of those symptoms, very much cross over into CIRS, and so getting the mast cells a little bit less activated and the histamine level down will often give the patient a lot of relief. The nutrient support would probably go right along with that because you need all those cofactors and nutrients we talked about. Then the infections come later. Now, that may be months later or weeks later, it doesn’t have to be a long time, but I do think step-wise removing from exposure and then treated infections is a great order of operations. What’s interesting too is that the infectious load I think also comes from the weakened immune system in a water-damaged building. These things are so correlated because if the person who’s in a water-damaged building, all of a sudden their immune system goes offline, and so their old infections or things that maybe weren’t bothering them, the viral load, the parasites, they tend to pop up because their weakened immune system is present. I think this order is a very, very appropriate way to look at it. Okay, next slide, thanks. Okay, so just finally talking a little bit about the Mold Illness Made Simple course very quickly before we get into questions. Really I just want to explain that this really has come through a passion that I had for people getting through this syndrome. I’m not sure if you’ve seen this Dr. Jill, but over here I found that a lot of patients were very, very overwhelmed when they found out they had CIRS and they found out that they’re in a water-damaged building. What I found sometimes was that overwhelmed leads to paralysis, and sometimes the overwhelm could lead them to actually not do anything, or not to move through this syndrome. Part of the overwhelm seemed to be that the information was just too confusing and there was too much of it, and basically people didn’t think that they could understand the whole thing. That appeared to be part of the confusion. You don’t want to read those. You don’t want to go through those documents. Really what you want is this, you want to just go through someone who’s made it really simple and has gone through the basic points and just given you the key points, and nothing else. That’s what I’ve created with Mold Illness Made Simple. Really, it is a big shortcut. I really believe that it can cut through the overwhelm very quickly. Really just to explain what’s involved, it’s an access at any time course, so it doesn’t run at specific times. Basically what we have is eight weeks in which there’s actually 18 modules. Each module consists of video lectures and slides, and there’s a PDF workbook for each chapter that you can download. There’s also weekly quizzes to make sure that you’ve comprehended the information okay, and if you’re not scoring well on those, that can be a trigger to go back and read the information again. There’s also a private Facebook group where we are starting to discuss new areas, such as mast cell activation syndrome and Lyme-like illnesses and various other nuances which are coming up in this syndrome. One of the most important sections in the course is remediation. One of the keys, if you’re looking at getting a house remediated, is you can’t just get any IEP or any indoor environmental professional. You need to make sure that the IEP is familiar with CIRS and is knowledgeable to deal with that. I actually believe that the course is worth it just for that point, and just for the questions to ask an IEP. I don’t know if you’ve found that in your area Dr. Jill, but that can be a real stumbling block for people if they’re going to people who really don’t understand CIRS and they’re really only wanting to get their house to a cosmetic level of cleanliness, that can just introduce a whole level of confusion that’s not needed. Basically the Mold Illness Made Simple course is a very simple way of going through this illness and to understand the alphabet soup. After this webinar we are offering a 25% off deal, and the code is BEATMCAS. There will be a link below in the YouTube, once this comes up on YouTube, that you can actually click on to get through to the sign up page and use that particular coupon code. I don’t know, have you have any feedback from patients, Jill, about the course and whether it has helped them in any way? I 110% endorse this course. I think it’s amazing. I think you’re done a phenomenal job to a very complex topic. I know when you first put the course out you allowed me to go through it as well, and I thought it was well done, well worth every penny. I really encourage you if you are confused or overwhelmed, get the course. You can do it in your own time, you can go back and check it out. I highly recommend it. Okay, great, and so if it’s okay with you Jill, we’ll now move on to questions and answers. 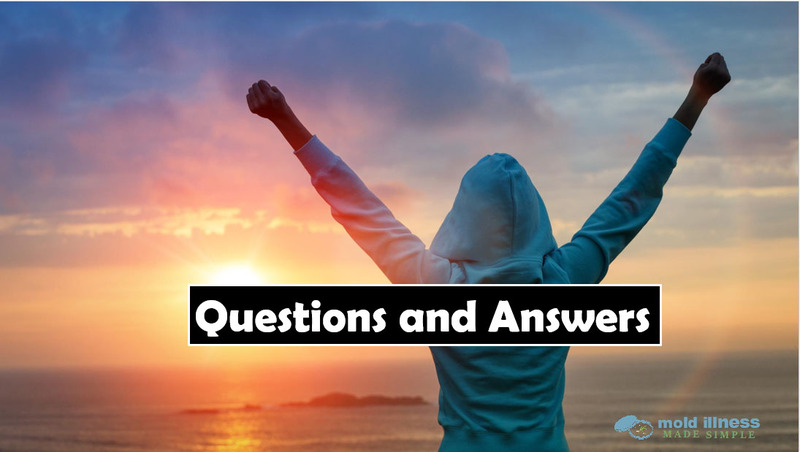 We do have a number of different questions and answers, and it’s always interesting to see what people will ask and the different nuances they’ll bring out. If that’s okay with you, I’ll jump into those now. Wow. This is so correlated because if the mast cells are out of control, you’re going to have a permeable gut. As we talked about with CIRS, if you have a low MSH you’re going to have a permeable gut. There’s evidence now that things like Crohn’s disease and colitis are correlated in some cases with low MSH. As we know, mast cells and MSH all goes together. Really you have to get the histamine under control in order to heal the gut. Now, we talked about order of operations but one thing I always say with healing the gut, you cannot just throw glutamine or gut-healing powders at the gut if you don’t treat the infections and the activation. You have to start with looking for dysbiosis or hidden infections, treating them, and then starting to lower histamine and elevate MSH and heal the gut. You’ll never heal the gut unless you deal with the histamine and the mast cell issues. Great, thank you. Then also a linked question, can hidden food allergies intersect with mast cell activation syndrome, CIRS, and chronic infections? Any sort of skin redness, redness is classic, rubor and heat with histamine, and inflammation. There’s some sort of inflammatory reaction going on. We don’t know what’s causing that, but could this be a mast cell activation type of reaction? Yes. Could it be something else? Yes. Unfortunately the answers is, it could be but it could also be something else. Right, so presumably this person could explore it with their physician and perhaps consider doing some of the MCAS testing, and if it’s looking suggestive they could try some of the treatment and see if they get a response. You know, the thing about the low histamine diet is anyone can try it. It’s free, it’s not difficult. You could try it for 30 days and see how you respond. I would say, that’s such a low cost, safe alternative for someone to try that anyone who would be interested in trying it could try it for 30 days and see if it helped. Oh, that would be fascinating research, but I don’t know of any data to support it. It might be the case, I don’t think we know. Right. Yeah. I think that’s true. I’ve seen a number of patients who just have low MSH and not the other biomarkers of CIRS, and it does seem that in some cases their problem is predominately gastrointestinal. Oh gosh. I’m sorry, but that’s not uncommon. That’s my classical, I mean, most of my patients are that complex. You know, getting out of the mold is huge because that’s such a, as we talked in the beginning, that could be the number one in most, I know Dr. Theo Theoharides, who is one of the world-leading experts, he’s written multiple articles on MCAS, almost any reviewed article you read about MCAS will be authored by him. He has said in several of my personal conversations with him, that even though he doesn’t treat CIRS and he doesn’t know a ton about mold, he sees mold as one of the number one triggers in MCAS. Mold would be my first thing to eliminate from your situation. That’s a great question because I see the viral load as a big player in some of these patients because of the weakened immune systems, and we’ll typically check EBV, IgG, VCA, which is an old past infection. We’ll check early antigen, IgG, and we’ll check nuclear antigen IgG. If all three of those are activated, it might be signaling a reactivation of the Epstein–Barr virus. If that’s the case, I will use multiple different herbal things in different proportions depending on the patient. Monolaurin can be effective. Olive leaf can be effective. Samento or Cat’s Claw can be effective. Also there’s a commercial product they’re using at Stanford university called Equilibrant. All of those things, depending on the patient, can be effective. Okay, great. Thank you for that. Dr. Raj Patel was talking a little bit about narrow band UVB therapy on the last webinar. Is that something that you’ve come across at all? I haven’t, but I’d love to learn more. Oh, this is fascinating. I think we need research, but it’s very, very interesting. That person is thinking outside the box, I love it. No, you can really layer as many of these things as it takes. It is trial and error and it’s layering. I have multiple patients who are on five or six different supplements or medications, or more. Okay, great, so most of them can be used together. You mentioned Vitamin C and Quercetin as being a really key base to a progam for MCAS. Could you share what a typical dosage might be that you use in your patients? Quercetin can be anywhere from 1 gram to 3-6 grams per day. Vitamin C, usually it’s about tolerance so if you get too much Vitamin C someone could have loose stools, but typically I’ll dose anywhere from 3-5 grams of Vitamin C.
Hm. Dr. Gupta, you’re probably more of an expert on this connection. Yeah, well I can tell you about the CIRS connection. Yes, there is definitely, definitely a big connection with EDS and CIRS. It’s almost like hypermobility syndromes of any type can be considered to be a separate genetic marker, while CIRS outside the HLA. to get a much higher release of TGFB to 1. That’s one part of it. There’s also a gentleman called Michael McEvoy from Metabolic Healing, who’s in Santa Cruz California, who’s been researching EDS particularly and its connection to the RCCX genes [RCCX gene theory and chronic illness – Dr. Meglathery]. He’s also particularly found that there are problems with aldosterone and Cortisol in patients with EDS, and they tend to be much more prone to postural orthostatic tachycardia syndrome (POTS). Basically he’s describing it as being a problem with the extracellular matrix, rather, in patients with Ehlers-Danlos syndrome. He’s actually trialing a number of peptides, growth peptides and so on, to try to boost the quality of the extracellular matrix to enhance the health of people with EDS. It’s quite an actually interesting, upcoming field, and we’ll definitely keep people updated. We may do a further webinar with Michael McEvoy. Well, it’s always tricky because I have a lot of patients who have very, very impaired digestion, so sometimes we’ll use liposomal formulations. We can get liposomal Vitamin C, liposomal glutathione, liposomal Methyl B vitamins, liposomal CoQ10. That’s a way to kind of bypass the gut and get enhance absorption. Some of these things like Cromolyn are liquid and they’re pretty highly absorbed, so there’s ways to work around that. Healing the gut simultaneously with controlling the mast cells can be really critical, because that is a problem. Great, thank you. Is there any reason to worry that antihistamine treatments would lead to a buildup of histamine, even though it helps with symptoms? In other words, is it possible that the receptors for histamine and so on may become upregulated throughout time? I’ve had this discussion with one very educated patient, and there seemed to be, I remember this was maybe a year or two again that there was some research on, just like serotonin reuptake inhibitors can have an effect on the receptors, there may be the same effect on some of these H1 H2 blockers, but the bottom line is we don’t really know. I just don’t think we have the evidence to say one way or the other. I do think if you feel like any of these things, interventions, make a patient worse, of course you stop them. I have seen that. I have seen patients where one thing won’t work and it will actually make them feel worse. Okay, great. Jill, during the CIRS conference you suggested that Oxytocin may be an effective alternative way to treat ADH or vasopressin problems. Have you continued to experiment with this and are you still seeing positive results? I have, and I am still seeing positive response. The nice thing about Oxytocin is I haven’t had a single patient have an adverse reaction. In some patients it doesn’t help, but in many of them it really stabilizes the whole posterior pituitary. Okay, great. Interesting, on the call with Dr. Ackerley we talked about relationship problems and it has been a really common thing. It’s possible that there could be a crossover with low Oxytocin and low ADH, meaning that there could just be a lower attachment between partners when someone’s starting to get CIRS. Have you found any improvement in relationships with patients take Oxytocin? Yes, I have. It’s being used in the autistic community as well just because of that connection, that social connection is impaired, and so there’s many types of social disorders where it’s being used as well. Lucky last, is activated charcoal safe to use as a binder for micro toxins during breastfeeding? Oh, that’s a great question. Charcoal is inert and so unless you’re absorbing nutrients, I really can’t speak to that safely on the webinar. That’d be an individual conversation. Yeah, I think there’s not really enough data to answer that question right at this point. This has been a great webinar Dr. Jill and I’ve certainly learned a lot myself. I really hope that the people who have tuned in have a lot better idea of MCAS now and when they might consider looking into it if they’re suffering from CIRS or from mold related problems. I want to give a big thank you to Dr. Jill for joining us today, and for all the pioneering work she’s doing in the functional medicine movement. Also a thank you to Caleb Rudd for the technical support and content support. Yeah, we look forward to catching up with you sometime soon, hopefully at a conference next year, Dr. Jill. Berndtson, K. (2016). Mast Cells – The good, the bad, and the ugly. Park Ridge MultiMed. Link. Carnahan, J. (2016). Mast Cell Activation Syndrome – When histamine goes haywire. Link. Carnahan, J. & Forsgren, S. (2017). Blogcast 20 – Mast Cell Activation Syndrome. BetterHealthGuy.com. Link.